San Francisco, California, USA - May 16, 2017: An Uber self-driving Volvo XC90 SUV on 7th street and Market part of Uber's testing program within San Francisco that resumed in March. 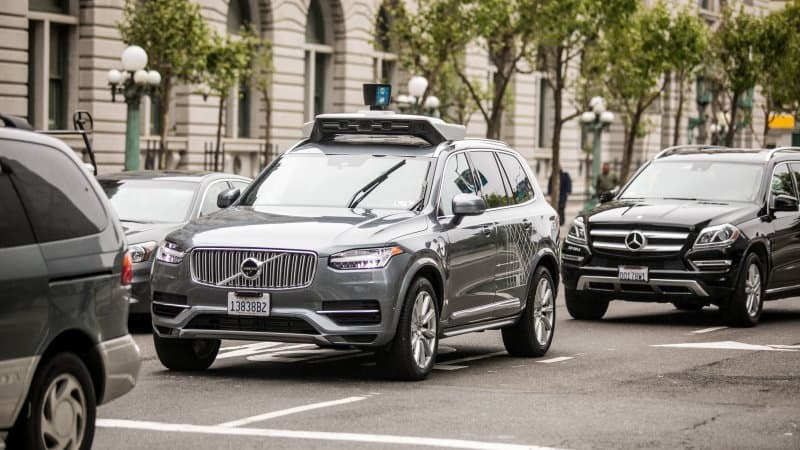 The self-driving system is still under development and Uber’s Advanced Technologies Group is working on it to help deploy it on such a large scale. The big deal might change the world of autonomous cars as Uber, one of the largest taxi operators plan to order 24,000 self-driving cars from Volvo and add them to their fleet to help people get to their location. Volvo and Uber enjoy a long-lasting relationship over three years which has convinced the company to place such a huge order with them rather than any other automobile manufacturer who has a much better setup in the world of electric and autonomous cars. In their own statement, Volvo confirmed that they are going to start delivering with XC90 SUV and later other models will be added to the lineup so as to touch the 24,000 mark by 2021. The self-driving system is still under development and Uber’s Advanced Technologies Group is working on it to help deploy it on such a large scale. The XC90 costs about $50,000 and will be available for passengers to pick up from any location with no driver in it. At first, they may have drivers for safety purpose but once their users are assured, it will become fully autonomous by dropping or picking up people of their desired locations.